Heroes Community - Are there imbalances in HOMM 3 ? Heroes Community > Library of Enlightenment > Thread: Are there imbalances in HOMM 3 ? Edited by phe at 23:06, 08 Jul 2018. Edited by bloodsucker at 01:00, 09 Jul 2018. Ok, my bad. Maybe you play better then me or still believe those boring first days will make a difference in the end, for me the major mistake in Heroes III conception. This I totally agree with you but would go for 1000 for every level. Hiring a totally overpowered hero for the price of a level one is a bug. This would also make Poorman's TP a bit harder. This is just speculating, because the game then would need total revamp. For instance, you assume that high level hero = good hero, which is not guaranteed at all, if the distribution of skills is AI made. A earth master low level will perform most battles much better than a hero 50 levels above but not mastering magic at all. A logistic master level 4 will travel faster than a level 99 but without the skill. Then what you do if for some reason, both heroes offered in tavern are high level and is early game? That would cripple you and not necessarily for a good result. Also the 5000g/hero will not work because the way maps and templates are internally coded implies that an early hero will cover its recruitment expense + generate extra income early, that's why you recruit more heroes and send them fight/explore instead of going the capitol tactic, which freezes the game development. Edited by phe at 14:14, 09 Jul 2018. Hero to prison in ERA, if you want to create a new option. We know that 2500g is right also prison. In H4 you pay to 1500g, 2000g or 2500g We don't need to 1500-2500g, because of H3 has built well. An option is only WoG, when half a trip to H4. This thread doesn't need a nonsense! I would say they absolutely did. Creatures are easy to defeat early and always guarding gold or resources behind. When you have to fight to get the gold, that means heroes are the key, since you can transfer your army and have several fights during same turn. 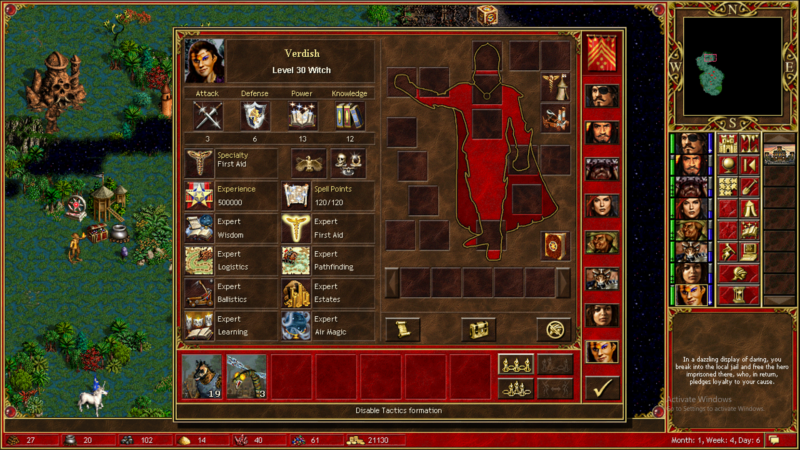 1) In the game you always should defeat guard and get resources and arts, irrespective of have you 1 hero or more. 2) Not always easily. If you mean random maps it is usually hard to defeat near monsters only with army of 1 tavern hero if you play with strong monsters option. But there are also usual maps, not random. 3) NWC did not mean so extensive usage of hero chains as it occured in reality. Well, many things that you say are debatable, especially hero chain, as intensive chains were used in H2 (even more than H3 as hero got back ALL movement upon dismiss/hire) and H3 inherited all that without a scratch. But all I basically say is that changing the cost of heroes will change subsequently many elements of the game, as it is played since 15 years. Probably not so much in fan designed not-so-hard maps, where time doesn't matter so much, but in multiplayer yes. For instance, you assume that high level hero = good hero, which is not guaranteed at all, if the distribution of skills is AI made. Edited by NimoStar at 00:42, 10 Jul 2018. They did not think this way. They though in AI battles with creatures you would have losses, which due to gamey tactics almost doesn't happen. They also made heroes always come with creatures the "1 gremlin thing" didn't come up until the expansions. In short NWC didn't think fast recruiting of heroes and heroes caravan would be so profitable. In fact, one the great changes of H4 is removing heroes caravan. Herpoes come with no creatures at all too. Not to mention adding prisons. But because people hated H4 for unrelated reasons don't see this is a logical development that shows NWC's balacing thoughs on the matter. Edited by Salamandre at 10:33, 10 Jul 2018. Logical doesn't always mean inspired. It failed. Not so bad for a crap witch. Logistic/pathfinding + air save the honor of AI picks. Well, I did it, in wog they are just great. Do same for SoD if you don't play wog. Edited by phoenix4ever at 11:48, 10 Jul 2018. One skill in H4, witch looks Bard class is a really good skill, but AI uses beastmaster. Edited by NimoStar at 15:24, 11 Jul 2018. Making first aid tent stack and resurrect was a good WoG idea. It was rushed and underfunded, doesn't mean removing obvious exploits wasn't a good idea, including the ones that makes games become an endless chain of heroes passing creatures around the map. Verdish is also defender in town, remember use a scholar. In WoG first aid can be over 30 then x 75 = over 2250HP. Just the game was a misfortune, but I won the game: armorer, artillery, wisdom, first aid, estates, and offense skills with. All expert, and primary skills were 13, 16, 21, 8. I defended my town, and then attacked them. Allied AI played as well. 2 allied vs all enemies in random map. It's one strategy, for example. Yes fun that my hero was strong lead. Hero really defender as scout, and secondary hero.